Ins Choi, Subway Stations of the Cross. Photo Credit Alex Feilpe. At the risk of sounding parochial, I have a difficult time enjoying spoken word poetry as a theatrical experience. I either find that my pleasure in the words would increase dramatically if I could just read them privately and ignore the person on stage acting them out for me, or I find that while the performer is engaging, the words fall flat. Maybe I’ve just been going to the wrong kind of spoken word shows. Or maybe it just took Ins Choi and his intriguing if somewhat widely woven solo show, Subway Stations of the Cross, to show me that watching a man reading and singing poetry on stage could hit many of my theatrical and intellectual sweet spots. 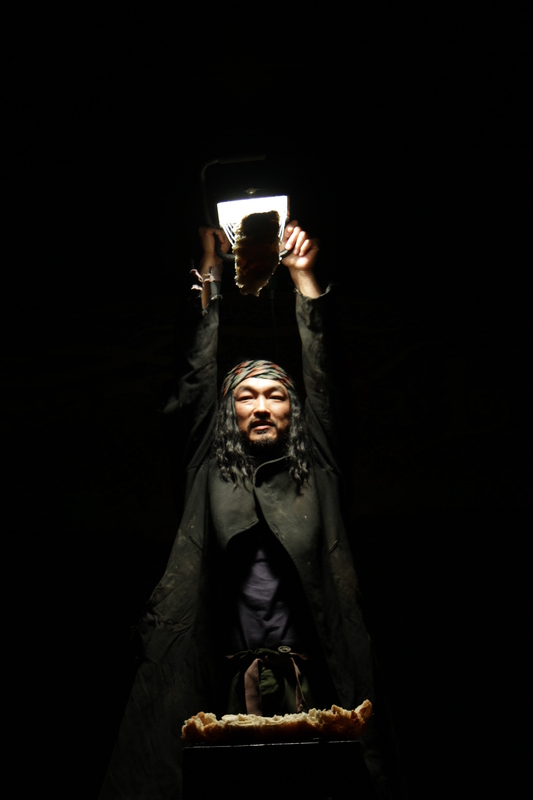 Choi’s sixty minute show which he wrote and stars in, introduces us to a nameless homeless man with nothing but a cardboard platform to stand on, a small guitar to play and a microphone and amp to ensure his message is heard. He may look like a cross between Captain Jack Sparrow and Godot’s Vladamir and Estragon, and he probably smells worse than all of them put together, but this is a man with profound ideas to share. Ideas that while referencing everything from icons of 80’s pop culture to Japanese Anime love metaphors, all come back to the notion of faith through the character of Jesus Christ. Choi says his poetry was inspired by the homeless and mentally ill men he met out in parks and public spaces in Toronto. These men would wax haphazardly poetic about all things mystic and religious while at the same time launching into non-sequitur tangents on whatever direction their uncaged minds took them. It’s these souls that Choi is channelling in his charismatic performance with a gravelly voice and stunned, sometimes stuttered but forceful delivery. And it’s with them in mind that Choi offers up some beautiful and challenging notions on faith in his poems and songs. “God is calling you to dance”, we are told along with lines alluding to our disco pants. We are given a list of all those creatures that fall from heaven to earth – ET, Superman, and Lucifer. We hear that, “forgiveness is for them, but forgiving is for you”. We are told to repent via a stunning poem that could serve equally as a trial judgement on white-collar crime as it could on old-fashioned sin. And we are asked to consider if Jesus would recycle and want to bring Elvis back if he were with us today. Interspersed among the heavier Christian themes in this piece are some fun and purely entertaining ditties. Chief among them is an ode to 80’s sitcoms that will have anyone old enough to remember when the gals on Facts of Life all got a little hefty laughing out loud. If it sounds to you like Subway Stations of the Cross is all over the place narratively without a definitive structure, then you’d be correct. This is not traditional storytelling in any sense of the word. Choi is starting from nowhere in particular and trying to achieve nothing conclusive. No doubt this will pose problems for many audience members who go to the performance expecting to have their faith tickled or to see an inspiring story. Choi is there to do neither. His musings are just that – musings on the faith he grew up with and still has connection to set to a modern, multifaceted and fragmented consciousness. It’s all done with a smartly light and fascinating touch right up till the end where Choi jumps the shark by bringing physical representation of the body and blood of Christ into the mix. It’s an effective crucifixion sight gag, but ultimately cheapens the experience by shoving a metaphor down our throats that had previously been beautifully only alluded to. Erudite, balanced, insightful. I googled this review because this show is coming (back?) to Toronto. The review makes me want to see it.